I have always felt the need to prove myself, to my parents, my friends, my boss, even the unknown person reading this blog. Determining whether our family would move to Thailand and the resulting preparation that has followed that decision has been no exception. While I knew these decisions did not rest solely on my shoulders, the impulse to “do it self” and to prove myself has been very strong. To illustrate this, I submit my tale of woe about my worm bin. While in Thailand, I was really taken by the idea of healing the soil or, rather, letting the land heal the soil. 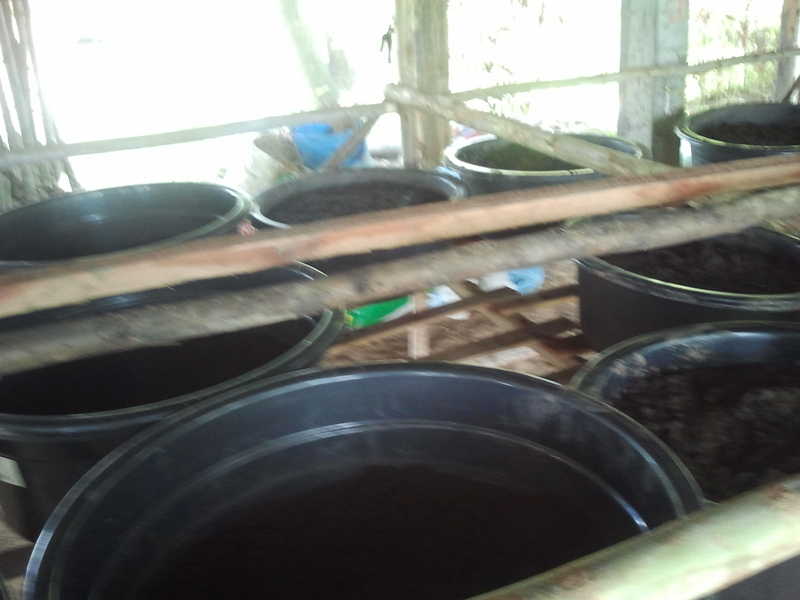 One way they do that is through vermaculture: worm composting. The Charis Project had 6 basins full of castings and worms with another 12 almost ready for worm transplant. Almost as soon as I got back from my trip to Thailand, I decided to make my own worm bins. But I did no research. I just did what my friend Aaron said worked for him. I already had lots of greens on the property, like grass and leaves. I went to Home Depot and paid $1.30 for a cubic foot of steer manure. And there are plenty of worms in my ground since I don’t use pesticides and I’ve been watering. So I mixed it all up and expected the best. So now, here I am, willing to admit defeat to my readers. Why? Because failure = learning opportunities. I mainly learned that research is rarely overrated. After searching online last night, I found a wealth of knowledge that told me I should have put the worms in the shade and that the manure should have been at least partially composted. After telling Aaron about this venture, he pretty much said the same and offered some more helpful advice. But here’s the main lesson, which I hopefully won’t have to learn over and over again. Just because we’re leaving for Thailand, leaving our friends and family, doesn’t mean we have to do it all ourselves. Our friends and family love us and want to help. There is really no benefit to undertaking any major endeavor by myself. Forsaking the support of those willing to help simply to “prove myself” capable to the rest of the world is only of relative worth. Those who expect me to do it all myself without asking for help are usually not worth impressing. If we need help just to make a worm bin, then maybe we can benefit from help as we undertake an even bigger endeavor that we’ve never done before: moving to another country. Now you may be asking, if we are not advocating that you “do it yourself” then what’s the title of this blog all about? Aren’t we all about the DIY life? Yes. Here we are, doing whatever it takes to grab hold of the good life. Here is our space to share what that looks like for us. We hope that our stories of failure and success inspire you to “do it (read: the good life) yourself,” to do whatever it takes to grab hold of your own good life. DIYtheGoodLife was never intended to refer to the need or desire for independence, but rather to emphasize the accessibility of the good life and the available resources that abound for us all in finding it. Of course, for us, that may mean a DIY project or two (homemade worm bins are awesome after all). So, what about you? Use the comment section to offer your own story or perspective or to talk about worms. We can all learn together.